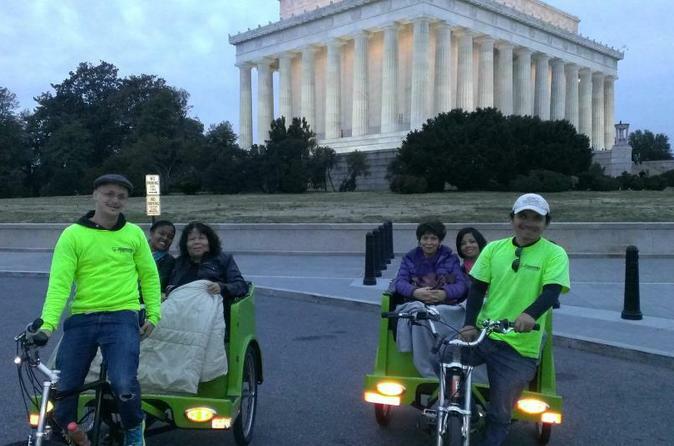 Enjoy the famous monuments and memorials of DC in an intimate and personally guided historical tour by pedicab. Every seat is a window seat in a pedicab - cruise at a relaxed pace and pause for photos whenever you like. This tour covers the entire west and south (around the Tidal Basin) part of the National Mall. Pick up location is flexible - it is recommended that tours start in the vicinity of the White House, though tours can also start at a metro station, restaurant, museum, or hotel in the area. Monuments and memorials visited during this tour include: Washington Monument, World War 2 Memorial, Jefferson Memorial, Franklin Delano Roosevelt Memorial, Martin Luther King Jr Memorial, Korean War Memorial, Lincoln Memorial, Vietnam Veterans Memorial, Constitution Gardens, and several other spots along the way. At any of these spots you are welcome to extend your tour and take as much time as you would like to go inside and explore or just take some memorable photos. Start times are available every 15 minutes from 9am until 8pm. Minimum tour length is one hour - any time after that time is pro-rated per minute ($1.25 / pedicab) and can be paid directly to the driver at the end of the tour. Each pedicab can seat 2-3 adults (with two there's plenty of leg room, with three it's cozier). One or two kids (8 and under) are welcome to sit on laps. Any umbrella stroller can be folded up and easily stowed on the pedicab as well.